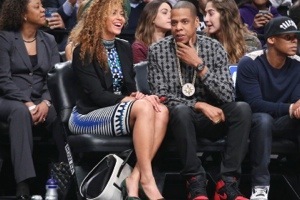 Home > Entertainment > Jay Z supports ‘Five Percenters’ While Organization Claims He Is NOT A Member! Smith rejected the notion of a supernatural deity and instead believed that all black men had God in them and that black women were “earths” who took on a complementary yet subordinate role to their gods. The idea is empowering, Knight says. To show followers the way, members must learn the Supreme Mathematics and Supreme Alphabet — powerful tools to decipher the meaning of the universe. In both, each letter and number represents a concept: for example, 1 is knowledge, 2 is wisdom, while A is Allah and B is be, or born. The number 7 on Jay Z’s pendant stands for God. Caucasians, meanwhile, don’t enjoy an exalted status in the narrative of the Five Percenters. “The first lesson I learned from the Five Percent was simple: F–k white people. Seriously. White people are devils,” Knight, 36, who is white and converted to ­Islam as a teenager, once wrote. He insisted the movement has been welcoming and that he views the controversial sentiment as a statement about power rather than biology. “For me, it is about who is marked as privileged in the power relations of this society,” he says.